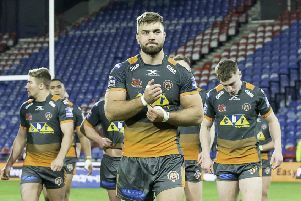 DANNY ORR said Castleford “did not turn up” as they were well beaten in France. The Tigers were second best in every department despite arriving in Perpignan earlier in the week. I thought defensively we had a soft attitude and they outmuscled us in a lot of departments. With the ball we just made too many errors. Josh Drinkwater scored a hat-trick of tries and kicked six goals in a man-of-the-match performance as Catalans climbed into the top eight. His 24-point game boosted the Dragons’ prospects of avoiding the turmoil of the ‘Million Pound Game’ they encountered last year. The game was played in sweltering heat, but Orr, assistant to coach Daryl Powell, offered no excuses. “I think there are a number of reasons, all credit to Catalans, I thought they were very good, but I didn’t think we turned up with a good attitude,” said Orr. “I thought defensively we had a soft attitude and they outmuscled us in a lot of departments. With the ball we just made too many errors. “We knew it would be a tough and physical game; they are a physical side, they’re playing well and they’ve got a bit of momentum behind them at the moment. Orr refused to blame a relaxed attitude, with the team having been in France longer than the usual in-on-the-day approach most sides adopt. “I don’t think it had an impact really. We’ve had good preparation, we’ve trained well all week and we’ve acclimatised to the weather,” he added. Catalans coach Steve McNamara could not hide his delight. “Given the conditions and given the opposition and the way that the opposition had been playing in recent weeks, to do that against them, we’re really, really pleased. It’s up there with our best of the year,” he said. Catalans Dragons: Gigot, Tierney, Mead, Wiliame, Yaha, Langi, Drinkwater, Casty, McIlorum, Simon, Jullien, Garcia, Bird. Substitutes: Anderson, Bousquet, Baitieri, Edwards. Castleford Tigers: Laulu-Togagae, Egodo, Webster, Shenton, Clare, Ellis, Trueman, Watts, McShane, Sene-Lefao, Moors, Holmes, Massey. Substitutes: Millington, Cook, Springer, Clark.